Horae Beatae Mariae Virginis ad usum Romanum (Book of Hours). 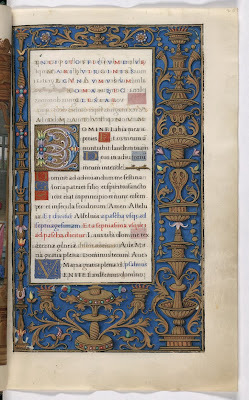 The manuscript is attributed to the Parisian workshop of Geoffrey Tory (1480–1533). In sixteenth century France, Geoffrey Tory and Claude Garamond designed graceful new types to accompany the books which they manufactured. 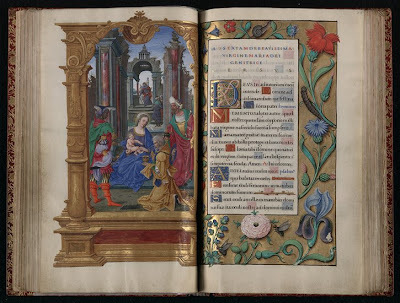 Books of Hours feature a cycle of prayers dedicated to the Virgin Mary. A typical book of hours contained The Little Office of the Blessed Virgin Mary, which included the fifteen Psalms of Degrees. et in secula seculorum. Amen. Alleluya. Nota quod alleluya. dicitur a pascha usque ad septuagesimam. Laus tibi domine rex eterne glorie. Invitatorium. Ave maria gratia plena dominus tecum.